It’s autumn here in Sydney. We’re in that awkward stage where you wake up in the morning and it’s freeeeeezing, but once the sun rises and the kids are off to school, the sun is beaming down as strongly as ever and all of a sudden you realize it’s actually really hot. And then you have a moment where you hope your kids have taken off their jackets at school and they’re not sweating to death! … Still crushing on my Oreo Thins Tiramisu, obviously! I just had to put this little number together. Cookies and cream tiramisu ice cream. This recipe has been heavily adapted from The White Ramekins’ Tiramisu Ice Cream recipe. The moment I saw it a while back, I knew I had to make it. 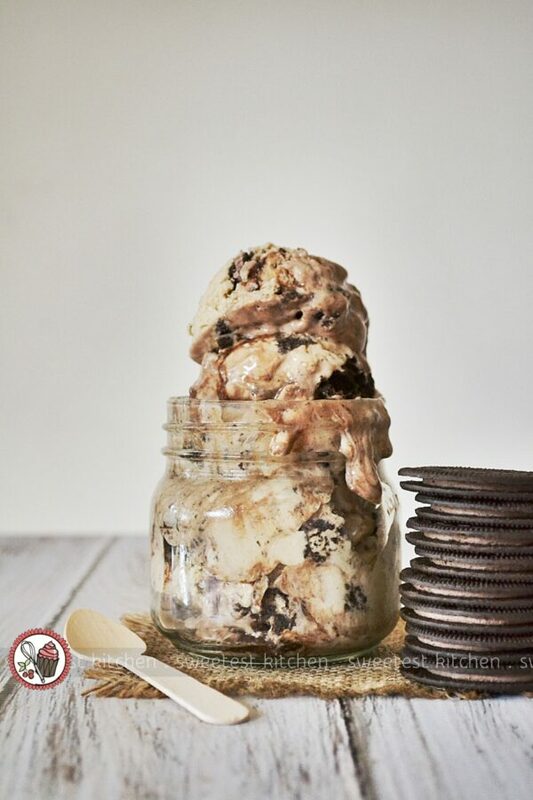 My idea for cookies and cream tiramisu ice cream totally needed this recipe to be involved. This is full-on homemade ice cream, my friends. Custard base and all. Don’t be scared of making this, though, it’s actually deceptively easy. And the results are totally worth any extra trouble. The vanilla ice cream base is mixed with creamy mascarpone and pure espresso, and just a touch of espresso powder to enhance the coffee flavor. It’s so rich and velvety, I could have almost eaten the entire bowl before I even turned it into ice cream! Oh, and I haven’t mentioned that mocha ripple! This is like an espresso-spiked chocolate syrup, it’s really delicious and would also taste nice just drizzled over a bowl of ice cream. It thickens in the freezer, but doesn’t freeze solid. However, it does melt down really quickly. This is the only thing I’d change about this recipe… if I were to make it again, I’d make up a thick ganache of chocolate and heavy cream, and add the espresso powder to this ganache (I’ll mention this in the recipe below). It would keep the ripple a bit cleaner, and I also prefer a thicker ripple, if that makes any sense! You know, I was trying to scoop out some really clean and perfect spoonfuls for these photos, but I left the container sitting out too long and it got too melty… I decided I really liked the messiness of the melting ice cream and just went with it. It kinda makes it look extra indulgent, do you think? Now that the cold early morning has passed and the sun has warmed things up, I’ll round up the kids and have a little picnic lunch outside under the gazebo; it’s a lovely autumn day. Might be even lovelier, though, if I had any of this ice cream left! What are you up to on these school holidays? Are you a relax-at-home kind of person, or are you more of a get-out-and-do-stuff person? Any school holiday traditions? Well, I think you should go make some ice cream these holidays! Enjoy! 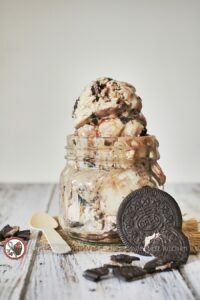 This indulgent cookies and cream tiramisu ice cream is easy to make and features the new Oreo Thins Tiramisu cookies, which enhance that gorgeous tiramisu flavor! The day before beginning this recipe, place your ice cream maker bowl in the freezer. 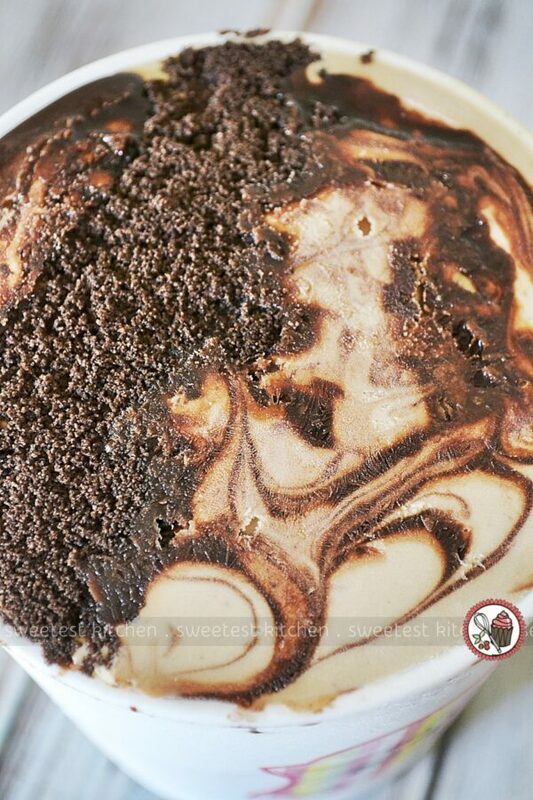 Mocha ripple*: Whisk together all the ingredients in a saucepan. Heat over medium heat, whisking constantly until the mixture begins to bubble slightly at the edges. Remove from heat and let cool completely in the refrigerator. Tiramisu ice cream: Pour milk and ½ cup of the thickened cream into a saucepan and heat over medium heat until the mixture just starts to boil. Meanwhile, whisk together egg yolks and sugar until light and creamy. While whisking vigorously, add two spoonfuls of the hot milk mixture to the egg mixture. Continue whisking until incorporated. While still whisking, pour the egg mixture, in a steady stream, into the remaining hot milk mixture the saucepan. Heat the custard on low heat, stirring constantly with a wooden spoon, until the custard coats the back of the spoon (a swipe of the finger on the back of the spoon should leave a trail). Strain through a fine sieve into a clean bowl, stir in the vanilla bean paste and set aside until cool to touch. In a medium bowl, whisk together mascarpone, remaining cream, espresso and espresso powder to combine. Add cooled custard and whisk until completely incorporated and the mixture is smooth and espresso powder has fully dissolved (if it doesn't dissolved fully straight away, let the mixture sit for a few minutes and give another whisk). Cover the bowl with plastic wrap and place in the refrigerator for at least 4 hours or overnight. Place an empty, clean medium bowl in the freezer (will be needing it later). When ice cream mixture is thoroughly chilled, pour into ice cream maker and churn according to the manufacturer's instructions. Meanwhile, crumble up the Oreo Thins into chunks. 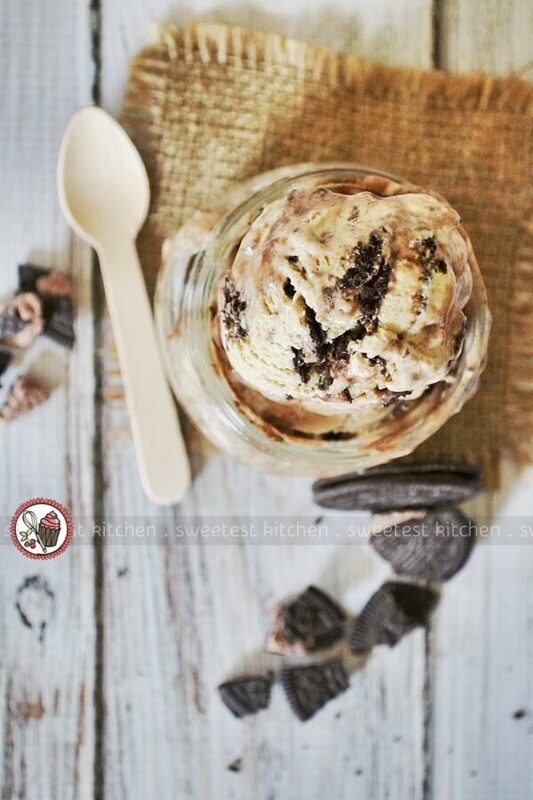 If using, also finely crush some Oreos to decorate the top of your ice cream. 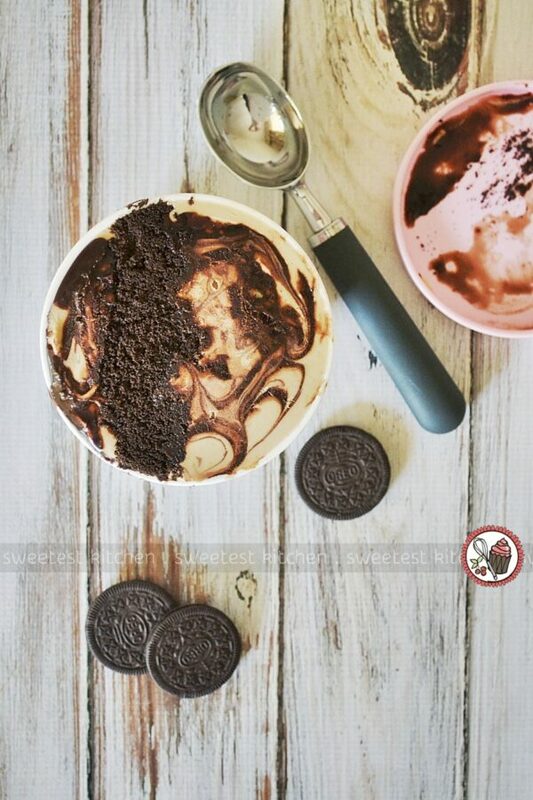 Transfer the ice cream to the chilled bowl and fold through the chunks of Oreo Thins. Feel free to add as little or as more chunks as you like! 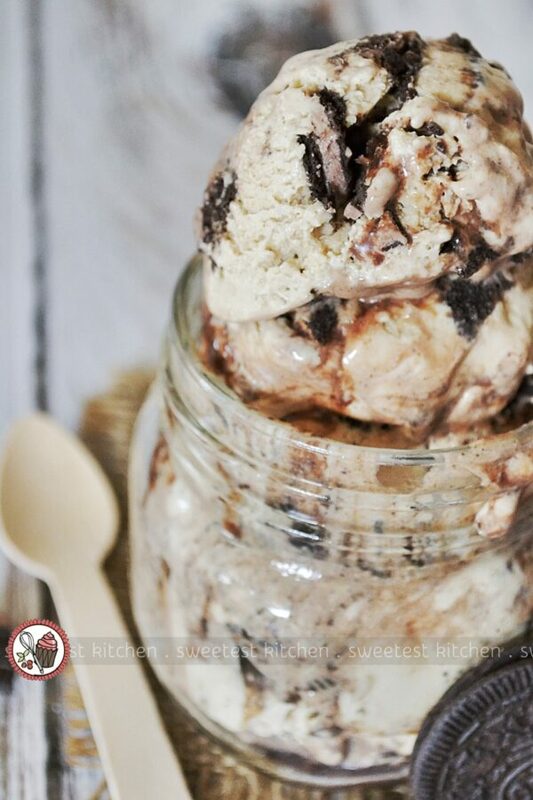 Working quickly, spoon a layer of the ice cream into an ice cream container. Drizzle over some of the mocha ripple sauce and swirl in with a butter knife. Repeat ice cream layer and drizzle layer, until you reach the top of your ice cream container. 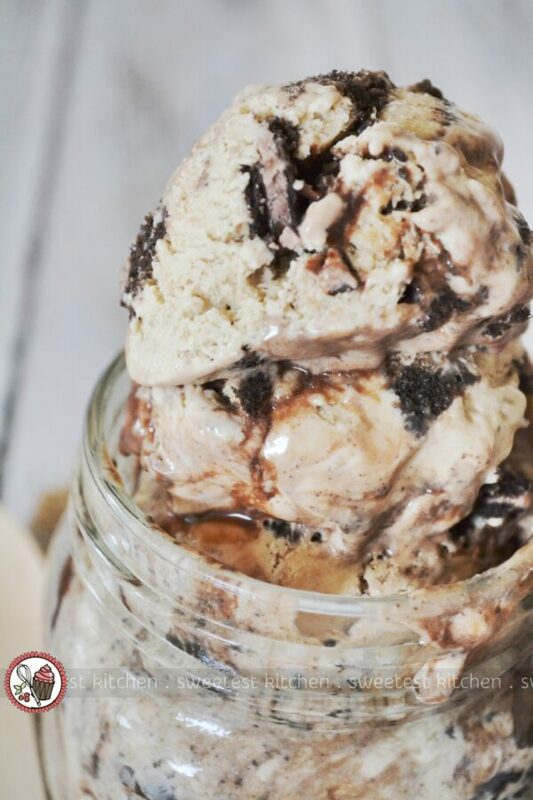 Finish off with an ice cream layer and a final layer of mocha ripple. 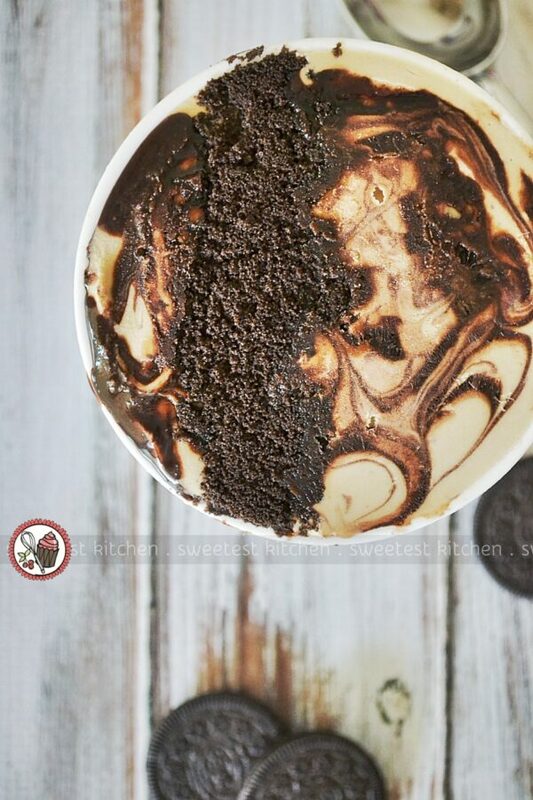 Carefully swirl in the mocha sauce to make it look pretty, and if desired, sprinkle over finely crushed Oreos for decoration. Tightly cover the container and freeze for at least 4 hours. This ice cream sets pretty hard, so leave it on the countertop to soften for about 10-15 minutes before digging in. Best eaten with a few days. * The mocha ripple sauce in the original recipe melts a little too quickly. It's kind of like a self-saucing ice cream! If you prefer a cleaner, thicker mocha ripple... finely chop 100g dark chocolate and place in a heatproof bowl. 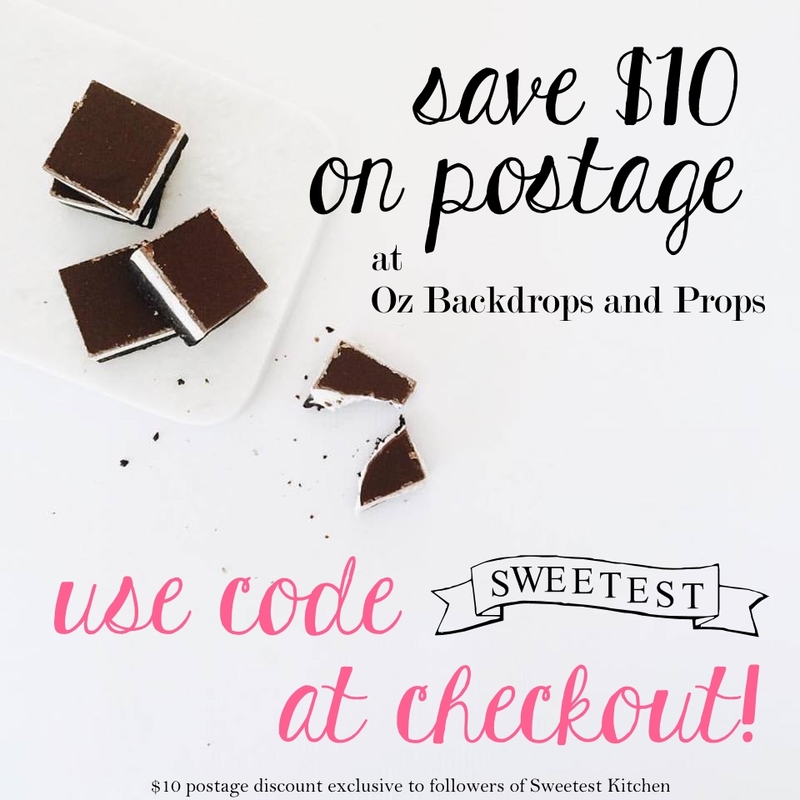 Bring ¼ cup thickened cream to just under a boil and pour into the bowl with the chocolate. Add 3-4 teaspoons espresso powder (depending on tastes) and stir gently until chocolate is melted and espresso powder is dissolved. Let set to thicken slightly and use this in place of the original mocha ripple sauce recipe. * You can use instant coffee crystals if this is all you have, but I'd suggest crushing/grinding the crystals into a powder so they will dissolve easier/quicker. * If Oreo Thins Tiramisu aren't available, you can use regular Oreos instead, but you won't need quite as many for this recipe.